Eternity, as it turns out, is overwhelming. Vincent van Gogh’s life was incredibly difficult. He was impoverished. Many of those who knew him feared him. He lived a transient existence, wandering the countryside of southern France, often hungry, painting what he found beautiful. He died of a gunshot wound, penniless and alone. But he also found great beauty in the world, and harboured a deep sustaining love for the natural world. This is an enigmatic film for an enigmatic figure; it doesn’t seek to simply list the facts of van Gogh’s life. Instead Schnabel attempts to place the viewer inside van Gogh’s mind. The film wants you to see the world as he did, with all of the awe and anxieties included. It wants to be as creative and mould-breaking as van Gogh was. It is successful, but that doesn’t necessarily mean it’s a good movie. Unfortunately, Julian Schnabel’s At Eternity’s Gate, the latest van Gogh biopic, goes too far down the path of tragedy, resulting in a miserable, unenjoyable film. 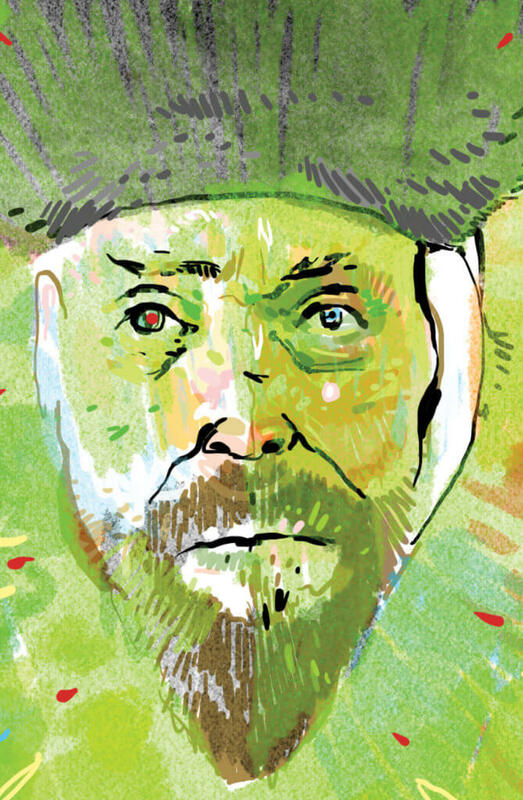 The pitch is this: Willem Dafoe is van Gogh. The film loosely follows the last few years of his life as his anxieties and depression overwhelm him. The film opens on black. We hear van Gogh tell us what he wants: to just sit and talk with other artists, to eat food, and to drink wine. Then we’re in a bar filled with artists, and van Gogh is kicked out. He travels south and begins to wander. There are a few brief reprieves from the loneliness – such as when fellow painter Paul Gauguin (played by Oscar Issac) visits van Gogh – but the film largely follows van Gogh’s lonely wandering through the countryside. It’s a depressing film and I didn’t enjoy watching it, but it’s not all bad. The performances, especially Dafoe’s, are great, but the film around it is not good. It’s not even the lonely plot that makes the film bad, either. There are plenty of great lonely films. The true problem is technical: the cinematography is very experimental, no doubt a call to van Gogh’s own experimentalism. Unfortunately, the camerawork just comes off as shaky and blurry, drawing attention to itself and all the ways it makes the act of viewing difficult. It spins, twists, jitters, flips, blurs and tumbles. I found it distracting and nauseating. Van Gogh says multiple times that he is in awe of the beauty of the world. Unfortunately, the film seems determined not to allow us to see this same beauty. The camera’s eccentricities are no doubt an attempt to communicate how disoriented and feverish van Gogh’s mind was, by alienating and prodding the audience constantly. It is by and large successful in making the audience feel van Gogh’s plights. However, the film never balances this with beauty or awe or love; when van Gogh experiences beauty and awe, the film, strangely, stops trying to make us empathize. There’s no moment of awe for us to feel. Instead we just watch van Gogh as he cries at a sunset, which we don’t see. The result is a film that’s just brutal and stressful from front to back. In the end, At Eternity’s Gate probably just wasn’t for who I was when I watched it. Maybe someone who more closely identifies with van Gogh will have a more profound experience. It is certainly a well-made film, and it definitely has a remarkable insight into the life of van Gogh. Not all of us can handle the life of a tortured artist, I guess.